We have received 41 reviews of Dragon's Green . You can add a review or scroll down to read reviews. To send in your review of Dragon's Green , please fill in the info below and click the button labelled Send Review Now. Reviews will be checked by our team before they appear on the website. Your last name will not appear on the site, but we need to know who you are in case you win a prize! Scarlett Thomas has always loved stories, magic and mysterious places. 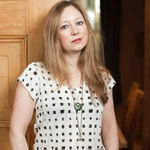 She tried (and failed) to write her first novel when she was six. Since then she has successfully written lots of novels, but this is her first one for children. She lives near the sea in an old house full of books, and is a professor in the English department of the University of Kent. Dragon's Green is the first volume in the Worldquake series. She thought of the title of the book when stopping at a café of the same name for tea with her husband. Scarlett believes that the best thing about children’s books is the magic. Effie Truelove has made a promise to keep her grandfather's magical books safe from danger. Whatever it takes. But it's not always easy when you're a pupil at the Tusitala School for the Gifted, Troubled and Strange. Together with her new schoolfriends, Maximilian, Wolf, Lexy and Raven, Effie must travel to the mysterious Otherworld and brave the terrifying Diberi, a secret organisation with plans that could destroy the entire universe. Scarlett’s favourite bookshop is called Big Green Bookshop in London. Read a Q and A with Scarlett here. I didn't like this book because it was really confusing due to the amount of characters and really long names. Thomas gave Dragon's Green 1 out of 5 and now plans to read Girls Can't Hit by T S Easton. Dragons Green was the book I was least looking forward to on the shortlist however was one of the most well explained and had the best story line. The third person perspective was different to the other books as they all were written in first person and by using a different perspective means that you look and feel about the book differently. Overall I am extremely excited for the next book in the series and would recommend this book to anyone that wants a good book to read. Ben gave Dragon's Green 5 out of 5 and now plans to read Ink by Alice Broadway. Grace gave Dragon's Green 5 out of 5 and now plans to read Ink by Alice Broadway. Jake gave Dragon's Green 5 out of 5 and now plans to read The Extraordinary Colours of Auden Dare by Zillah Bethell. This was an amazing fantastical piece of writing. this is possibly the best fantasy book I have read since the 'Harry Potter' series. marlie gave Dragon's Green 5 out of 5 and now plans to read The Extraordinary Colours of Auden Dare by Zillah Bethell. Overall I loved this book and found that it was very exciting when you got into it. At first I found that there wasn’t much going on and was quite boring at the begginning. But as you got further into the book it became exciting and I couldn’t put it down. The other thing though that I found with dragon’s green was that it was quite confusing and hard to understand with all the new things that were being added but without a definition of what they were. It was a good book and would still recommend it but it wasn’t perfect. Isabel gave Dragon's Green 4 out of 5 and now plans to read Welcome to Nowhere by Elizabeth Laird. I really didn't enjoy this book. the ending could have been a lot better and the main plot could have been improved immensely. Jacob gave Dragon's Green 2 out of 5 and now plans to read Girls Can't Hit by T S Easton. Good book, very descriptive. I love the slip from reality into something completely new and how it is very true to how bookworms feel when reading! Naomi gave Dragon's Green 5 out of 5 and now plans to read Girls Can't Hit by T S Easton. First off, I felt somewhat confused on what was happening in certain parts of the book which made it a bit harder to read, although it cleared up a bit through out the story. I somewhat felt emotion to most of the characters like Lexy or Wolf mostly Effie though , as expected. Anna gave Dragon's Green 3 out of 5 and now plans to read Girls Can't Hit by T S Easton. Dragon's Green is an easy read with a very quick-paced and action-packed storyline. I enjoyed this book more and more as I got further into it however sometimes struggled to follow the two different events happening at the same time. I felt some emotion toward the characters (particularly anger towards the villainous characters) and could easily picture myself as one of the characters. I especially found the relatable things a child who enjoys books does particularly funny. A story that took me out of reality and into a trouble-free world of adventure. Maddie gave Dragon's Green 3 out of 5 and now plans to read Ink by Alice Broadway. This book had an interesting plot, that had quite a few interesting twists but it took a while to get into and the plot repeated itself slightly at some points. However, if you like fantasy then you would love this book as the author has written in a great adventure for Effie and you will enjoy finding out what happens next. Despite the fact that I didn't like it, I think that it has been written well. Olivia gave Dragon's Green 2 out of 5 and now plans to read Welcome to Nowhere by Elizabeth Laird. I thought this book would be very unusual, and it was! However, I enjoyed it and would happily read it again.I would recommend this book if you’re wanting something a bit different and out of this world! Kaitlyn gave Dragon's Green 3 out of 5 and now plans to read I Have No Secrets by Penny Joelson. Cherry gave Dragon's Green 5 out of 5 and now plans to read Welcome to Nowhere by Elizabeth Laird. One of the best books I have ever read, well done to Scarlett Thomas for creating one of the best page-turners yet. 'The Chosen Ones' book tow, will definitely be on my new reading list. If you like magic, adventure and myths, read Dragons Green, and even the world-quake series, I definitely will. I would love to see this book be known as one of the greats, J.K Rowling has a brand new rival! In my opinion the plot is horrible. I hate that the items are introduced and never get a proper meaning. The start of the book can get you in but it doesn't help the rest. Even though I don't really like this book even I must admit that the detail is very well done and you could imagine the world quite well. I also love the idea of a world with out a internet. I just believe this book can fit offer book fans that enjoyed Harry Potter but this isn't my type of book. Violet gave Dragon's Green 2 out of 5 and now plans to read The Extraordinary Colours of Auden Dare by Zillah Bethell. Dragons Green is a book that (literally) lets you escape into the world of a book. All Effie wanted was to save the memory of her grandfather, with boons and lots and lots of books. It is an amazing book that is really easy to get into and I would definitely recommend it to anyone. Just amazing. Natasha gave Dragon's Green 5 out of 5 and now plans to read The Extraordinary Colours of Auden Dare by Zillah Bethell. Alfie gave Dragon's Green 5 out of 5 and now plans to read Ink by Alice Broadway. I really enjoyed this book as it was about magic,mystery and adventure. At certain parts I got bored and some parts of the story were confusing but those were just small parts overall the book was a great read. Jake gave Dragon's Green 4 out of 5 and now plans to read Girls Can't Hit by T S Easton. 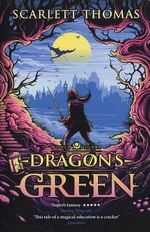 I found dragons green to be the type of book for people who love either fantasy or who are younger readers (I especially thought this at the beginning of the story) and thought it extremely slow starting. I felt the storyline was in no way based on real events, which may sound strange as it is a fantasy book but I have read other book with a similar storyline that have so many links to modern life when read into. Despite this, I think it would be a great read for younger readers and had a beautiful imagage for Effie's grandfather, his house and his ptrecious belongings. Hannah gave Dragon's Green 2 out of 5 and now plans to read Welcome to Nowhere by Elizabeth Laird. Tara gave Dragon's Green 5 out of 5 and now plans to read The Extraordinary Colours of Auden Dare by Zillah Bethell. Dragons green is a great fantasy book that takes place in a future earth and in this world magic is hidden but exists. It follows the plot of Effie a girl determined to retrieve her grandfathers books and along the way finds new friends, gets enemies and goes to another world. I recommend it to people who enjoy fantasy books and video games. Oren gave Dragon's Green 4 out of 5 and now plans to read The Extraordinary Colours of Auden Dare by Zillah Bethell. I think that dragon's green is a good book, however the storyline let it down :(. I think that Effie's storyline was off task and difficult to understand, and I found it very confusing. I think this is a good book but a bit over complicated. I think the personification of things is very unrealistic. Marco gave Dragon's Green 4 out of 5 and now plans to read Welcome to Nowhere by Elizabeth Laird. Danny gave Dragon's Green 4 out of 5 and now plans to read The Extraordinary Colours of Auden Dare by Zillah Bethell. I thought that this book was excellent but not quite award winning. Don't get me wrong, I thoroughly enjoyed it and would highly recommend it but to me it doesn't have the impact of some of the other books. It is definitely made to be more casual but I think to win it would need to address an issue or generally be more hard hitting. Jem gave Dragon's Green 4 out of 5 and now plans to read Welcome to Nowhere by Elizabeth Laird. It was a magical book.I got a bit confused at the beginning but as i began reading it got really interesting. Maria gave Dragon's Green 4 out of 5 and now plans to read The Extraordinary Colours of Auden Dare by Zillah Bethell. Dragon's green is an OK story with lots of magical creatures that one girl and her team need to defeat. I think that some characters are explained well and others need some more developing. Lenard Lavar needs a lot more explaining as I couldn't understand the character and it needed a bit more. I could relate to the team because you could be either a leader or smart or strong (Effie, Max or Wolf). Evan gave Dragon's Green 3 out of 5 and now plans to read Ink by Alice Broadway. Imagine a world where everything is split in two. Effie`s world is exactly like that. The otherworld and realworld are not combined. Effie must go on a journey to ensure the boons her granddad left for her are safe. She is left with two instructions, find Dragon`s Green and the answer is heat. Can Effie and her friends solve the mystery. This book was hard to get into and at times the storyline didn't make sense. In my opinion, the middle is the best part and everything clicks at the end. Characters are crafted with care. My one piece of advice to anyone reading is to persevere. Helen gave Dragon's Green 3 out of 5 and now plans to read Welcome to Nowhere by Elizabeth Laird. This book was complicated but only if you wanted it to be as the writer filled it with information until it pops but only if you help blow up the balloon. The universe this world is set in is (unlike most other stories of this genre) set after the industrial revolution which is an interesting plot devise. The other side of this book is a magical universe which is a bit less defined then the modern side (that may be because we donâ€™t live in the magic world) but it's still complex and Scarlett Thomas clearly thought lots abought this side of the book. Apart from that the book is a great read. oliver gave Dragon's Green 3 out of 5 and now plans to read The Extraordinary Colours of Auden Dare by Zillah Bethell. Dragon's Green is a book that brings reality and magic into a complicated alternate reality with somewhat relateable characters and ideas. After an event dubbed the "worldquake", all internet and mobile phones are lost making communication harder than before and forcing the world to go back to pen and paper, and use pagers/radio recievers. who, as a character, introduces an idea of two realities which in my opinion overcomplicates the general jist of the book. I found this book hard to read as the characters although relateable feel bleak and 2 dimensional with lacking emotion and connection. The only two characters who felt real and that I could picture in my mind were Griffin/Cosmo and the Dragon. Personally this is not my kind of book, although some fans of the genre would possibly like it despite the flaws I have adressed. William gave Dragon's Green 2 out of 5 and now plans to read Ink by Alice Broadway. Hifza gave Dragon's Green 5 out of 5 and now plans to read Girls Can't Hit by T S Easton. It is an incredible book if you love the concept of magic. Even though I don't like magic that much, I enjoyed the book and would recommend it. The main idea is to convey that friendship and corporation are extremely important, and friends can achieve their goals together if they work together. Atena gave Dragon's Green 4 out of 5 and now plans to read Ink by Alice Broadway. I loved this book and I am looking forward for the rest of the series. I like how it shows that books have power.The story was very interesting, I like the use of riddles and puzzles that give you a good lot to think about. My favorite so far I would highly recommend. Harrison gave Dragon's Green 5 out of 5 and now plans to read Ink by Alice Broadway. I thought the book was so exciting and was such a great book my favorite out of all of them by far. It was very magical and i would say might even be better than Harry Potter. Amber gave Dragon's Green 5 out of 5 and now plans to read The Extraordinary Colours of Auden Dare by Zillah Bethell. Zoya gave Dragon's Green 5 out of 5 and now plans to read The Extraordinary Colours of Auden Dare by Zillah Bethell. I loved this book because it shows that book have power.I would recommend it strongly. Gloria-Alida gave Dragon's Green 5 out of 5 and now plans to read Welcome to Nowhere by Elizabeth Laird. I think Dragon's Green is an excellent story. I really love the riddles in it and it's one of the only stories I've read with riddles I appreciate. I enjoyed learning about the characters, particularly Effie, and learning with them about the otherworld. Dragon's Green also gives you a look into what life might be like if our homes (as technically advanced as they are) were hit with an earthquake or world quake and basically sent back in time 100 years. I also liked how Effie, Maximillian, Wolf, Raven and Lexie were completely different but still managed to come together as friends. Sam gave Dragon's Green 5 out of 5 and now plans to read Girls Can't Hit by T S Easton. this a brilliant book set in the normal world but with a side to it that is both imaginative and exciting. what i love about it most is that it could be completely true. my favorite part was when Effie was in the book. Qianye gave Dragon's Green 5 out of 5 and now plans to read Ink by Alice Broadway. Samuel gave Dragon's Green 4 out of 5 and now plans to read I Have No Secrets by Penny Joelson. To me Dragons Green was an escape into a fantasy world that could only be brought to life by the content of a book. I found it amazing that the author managed to include multiple characters that I could relate to in multiple different ways. My favourite character was by far Max, because his character is such a mystery and unpredictable. I found it amazing that the author managed to include such an in depth description and such a powerful deliberation of imagination. I found that it was a great book! Charlie gave Dragon's Green 5 out of 5 and now plans to read Welcome to Nowhere by Elizabeth Laird. Deia gave Dragon's Green 5 out of 5 and now plans to read The Extraordinary Colours of Auden Dare by Zillah Bethell. An interesting take on the fantasy genre, mixing magic and myth. I found it easy to read but not very emotionally engaging at first.However, found my feet as the book progressed, finding a deep connection with the character Maximillian and eventually warming to the persona of the dragon. I also then came to value the relationship between Effie and her grandfather and even felt a little connected to Mrs Beathag-Hide in the end. Overall, it is a book I warmed to over time though it didn't really work for me in the beginning. Poppy gave Dragon's Green 3 out of 5 and now plans to read I Have No Secrets by Penny Joelson.